Welcome to the latest edition of the Inclusive Growth Bulletin, the newsletter produced by the International Policy Centre for Inclusive Growth (IPC-IG). 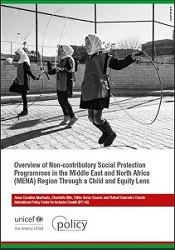 This new edition is almost entirely devoted to the theme of social protection in the Middle East and North Africa (MENA) region. 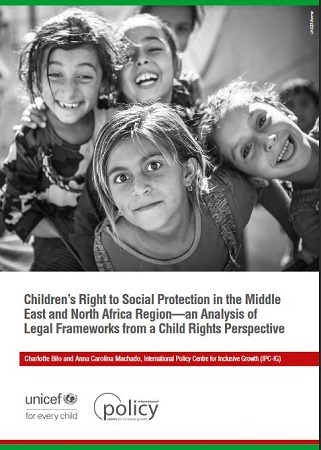 We are pleased to share new IPC-IG studies on social protection in MENA, including the "Children’s Right to Social Protection in the Middle East and North Africa (MENA) Region—an Analysis of Legal Frameworks from a Child Rights Perspective"
We are proud to present a new report, prepared in partnership with UNICEF MENARO: “Children’s Right to Social Protection in the Middle East and North Africa (MENA) Region—an Analysis of Legal Frameworks from a Child Rights Perspective”. While increased attention is being paid to the role of social protection in improving human development indicators, especially among children, it is important to remember that access to social protection is not just a matter of policies but one of rights, as enshrined in several international human rights instruments, including the Convention on the Rights of the Child (CRC). A human rights-based approach to social protection foresees that programmes are anchored in a system of rights, clearly establishing citizens’ entitlements and corresponding obligations for the State. The study seeks to answer three main questions: What is the status of the right to social protection in the region? Are social protection programmes embedded in legislation? How are human rights principles enshrined in the legal frameworks of the programmes? Read more here. This analysis was composed by Anna Carolina Machado and Charlotte Bilo, (IPC-IG), and is available as a free download in English, in .PDF and smartphone/tablet-friendly formats. A companion One Pager is available in Arabic, English, French and Portuguese. It is the second in a series of four studies that have been developed as part of a partnership between the IPC-IG and the UNICEF MENARO. The series launched with an “Overview of non-contributory social protection programmes in the Middle East and North Africa (MENA) region though a child and equity lens.” The two forthcoming studies will discuss ways to increase fiscal space and resources for social protection for children and assess whether the existing systems in the region are equipped to continue providing protection when faced with shocks, such as conflicts or natural disasters. Still in the MENA region, we continue with our series of One Pagers, featuring each of the 20 countries mapped in the launch study. This month we bring you a new batch, featuring Syria, (Arabic, English, French and Portuguese), and Tunisia (Arabic, English, French and Portuguese). Previously-released One Pagers in this series include: Algeria; Bahrain; Djibouti; Egypt; Iran; Iraq; Jordan; Kuwait; Lebanon; Libya; Morocco; Oman; Palestine; Qatar; Saudi Arabia, and Sudan. Find them all sorted by language: Arabic, English, French and Portuguese. For further information and critical articles featuring diverse perspectives on social protection in the MENA region, please check out the December 2017 issue of the Centre’s flagship magazine, Policy in Focus, titled "Social Protection after the Arab Spring". It is available in Arabic, English and French. We also recommend the Working Paper: "The role of zakat in the provision of social protection: a comparison between Jordan, Palestine and Sudan". It explains the relationship between zakat—one of the five pillars of Islam, which can be understood as a religious duty of those who are well-off to help those in need through financial or in-kind contributions—and social welfare. It's available in English, and an accompanying One Pager is available in Arabic, English, and Portuguese. Our colleagues and partners at socialprotection.org would like to invite you to subscribe to the online platform dedicated to social protection themes (here). Registration is completely free. socialprotection.org is the first unbranded platform dedicated to social protection issues, promoting and disseminating a wealth of content from a wide array of stakeholders in the field. The platform is available in English, French and Spanish. There, you can register for free webinars, engage with other members dedicated to a particular interest area by creating or joining an Online Community, or access relevant publications, among many other activities. If you have enjoyed the new studies presented in this issue, we invite you to join the Online Community: “Social Protection in the Middle East and North Africa region (MENA)”. Start exploring the platform’s new and exciting interactive features by registering now. IPC-IG's Research Coordinator, Sergei Soares, and researcher Anna Carolina Machado participated in the international conference “First National Assizes of Social Protection - Together for an Integrated and Sustainable Social Protection System” (Les Premières Assisses Nationales de la Protection Sociale – Ensemble pour un Système de Protection Sociale Integré et Pérenne), in Skhirat, Morocco, from 12 to 13 November. 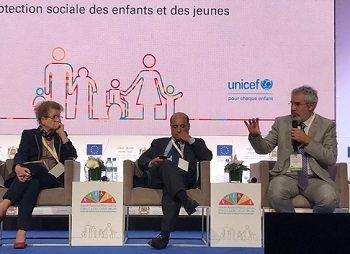 The event was organised by the UNICEF, the Moroccan Ministry of State for General Affairs and Governance, and the European Union. The IPC-IG was invited by UNICEF to collaborate in two different panels. Dr. Soares presented a panorama of experiences of social protection programmes for children (focused on case studies in Latin America and the Middle East), while Ms. Machado presented the case of social protection for groups in situations of extreme vulnerability—especially homeless people, orphans, and people on the move (such as refugees and internally displaced persons). She provided examples of cases and best practices in Brazil, Latin America, and the MENA region. 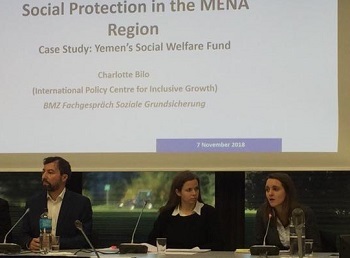 Researcher Charlotte Bilo presented the Centre’s recent studies on the MENA region and the Social Welfare Fund in Yemen during a Brown Bag Lunch event on social protection, organised by the German Federal Ministry for Economic Cooperation and Development (BMZ) in Bonn, on 7 November. On the same day, she also attended the PEGNET Expert Meeting on the effects of social cash transfers on the different dimensions of poverty, at the German Development Institute (DIE). This event discussed the empirical evidence on the effects of social cash transfer schemes on the multiple dimensions of poverty and their implications for policy-making and German development cooperation part. IPC-IG Senior Research Coordinator, Rafael Osorio, and researchers Anna Carolina Machado and Pedro Arruda travelled to Khartoum, from 28 October to 2 November, as part of a technical project conducted in partnership with UNICEF MENARO. The IPC-IG will provide support to UNICEF country offices in the region. 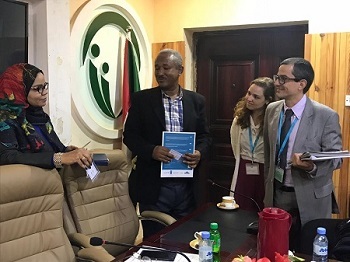 In Sudan, the Centre will work with UNICEF to build a roadmap to strengthen the national social protection system, which includes identifying the main programmes and policies in place, as well as their main challenges and viable solutions to improve the social safety nets in the country. During the mission, the researchers met with representatives from key government stakeholders in the social protection sector, such as the Ministry of Security and Social Development (MoSSD), the Commission for Social Safety Nets, and the Ministry of Finance. In addition, a one-day workshop with MoSSD representatives was conducted in collaboration with UNICEF’s Social Policy team, Ms. Kumiko Imai and Mr. Elmoiz Ismail. IPC-IG's consultants, Vinicius Vaz Nogueira and Elisio Mazive, travelled to the capital, Maputo, and to the provinces of Manica, Nampula and Zambezia, from 25 September to 20 October, to participate in a mission organised by the World Food Programme (WFP). 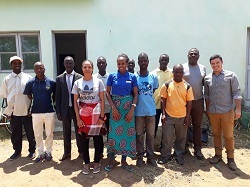 The mission is part of the joint project between the IPC-IG and WFP, to evaluate the impact of WFP's initiative of improving market access for vulnerable smallholder farmers in Mozambique. The consultants supported the survey data collection activities and conducted interviews with representatives from the national and provincial governments for the project’s qualitative component.